In 1754 this wax portrait doll was given as a gift at the baptism of the child Louis. It is dressed in a copy of the clothes he wore, covered with gold embroidery and pearls. 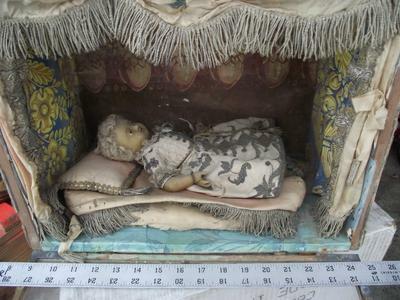 Many years after the French revolution it was found in a religious home in Avignon, France, where it was used as the infant Jesus. To See pictures of the doll and the box please click the link below.